When you add a modern page to a site, you add and customize web parts, which are the building blocks of your page. This article focuses on the Code snippet web part. The Code snippet web part allows you to easily display code as text on your page for others to use or learn from. 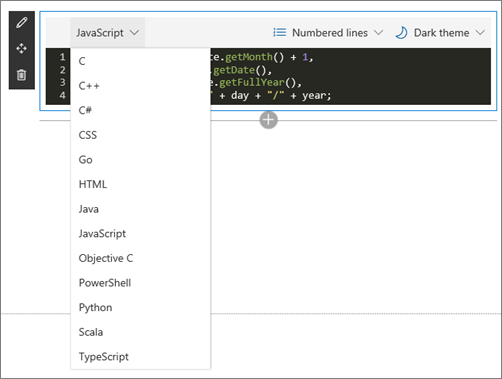 You can select the code language and a dark or light theme. The web part even auto-corrects syntax. Go to the page where you want to add the Code snippet web part. Click +, and then select Code snippet from the list of web parts. On the toolbar, select the language, whether you want numbered lines, and a light or dark theme. Click Edit web part on the left side to turn line wrapping on or off.